Red Sox Rally In The 9th To Beat Dodgers, Lead Series 3-1 The Red Sox are one win away from their ninth World Series title after defeating the Los Angeles Dodgers 9-6 on their home turf Saturday night. 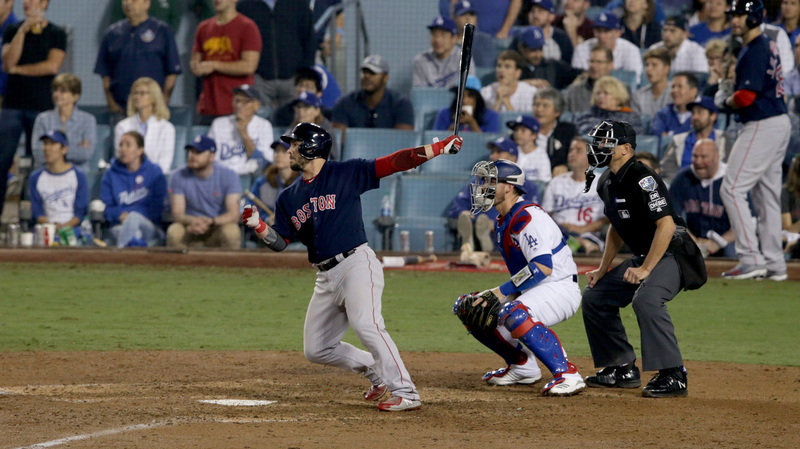 Steve Pearce of the Boston Red Sox hits a three-run double in the ninth inning against the Los Angeles Dodgers in Game 4 of the World Series at Dodger Stadium Saturday. The Boston Red Sox stand one win away from their ninth World Series title after defeating the Los Angeles Dodgers 9-6 in Game 4 of the best of seven contest. Los Angeles third baseman Justin Turner took the game's first run in the bottom of the sixth and the Dodgers took a 4-0 lead when right-fielder Yasiel Puig hit a three-run homer off of Boston's Eduardo Rodriguez — who slammed his glove in frustration. Red Sox first baseman Steve Pearce hit a solo homer in the eighth to tie the game 4-4. But instead of Friday night's tied game, which lasted more than seven hours by the time the Dodgers' Max Muncy hit a walk-off home run in the 18th inning, Saturday night's game took a turn for Boston with a five-run rally in the top of the ninth. Red Sox pinch-hitter Rafael Devers hit a single for Brock Holt to break the tie. That lead solidified with Steve Pearce hitting a three-run double. Pearce scored the fifth run of the top of the ninth on a single from Xander Bogaerts. The Dodgers' Enrique Hernández put less distance between the run totals with a two-run homer in the bottom of the ninth, but it wasn't enough to overcome Boston's lead. Game 5 is Sunday, again in Los Angeles, where the Red Sox have the chance to win their fourth World Series since 2004. Only six teams have overcome a 3-1 series deficit to win the World Series, according to The Associated Press. If Los Angeles were to come back it would be their first World Series win since 1988.